Definition at line 33 of file cfpython_object.c. Referenced by Crossfire_Object_ActivateRune(), Crossfire_Object_AddExp(), Crossfire_Object_Apply(), Crossfire_Object_Arrest(), Crossfire_Object_Cast(), Crossfire_Object_CastAbility(), Crossfire_Object_ChangeAbil(), Crossfire_Object_CheckArchInventory(), Crossfire_Object_CheckInventory(), Crossfire_Object_CheckTrigger(), Crossfire_Object_CreateInside(), Crossfire_Object_CreateTimer(), Crossfire_Object_Drop(), Crossfire_Object_Event(), Crossfire_Object_ForgetSpell(), Crossfire_Object_GetOutOfMap(), Crossfire_Object_GetResist(), Crossfire_Object_InsertInto(), Crossfire_Object_KnowSpell(), Crossfire_Object_LearnSpell(), Crossfire_Object_Move(), Crossfire_Object_MoveTo(), Crossfire_Object_Pay(), Crossfire_Object_PayAmount(), Crossfire_Object_QueryName(), Crossfire_Object_ReadKey(), Crossfire_Object_Remove(), Crossfire_Object_RemoveDepletion(), Crossfire_Object_Reposition(), Crossfire_Object_Say(), Crossfire_Object_SetResist(), Crossfire_Object_Take(), Crossfire_Object_Teleport(), Crossfire_Object_WriteKey(), Crossfire_Player_CanPay(), Crossfire_Player_Message(), Object_GetAbove(), Object_GetAC(), Object_GetAlive(), Object_GetAnim(), Object_GetAnimated(), Object_GetAnimSpeed(), Object_GetApplied(), Object_GetArchetype(), Object_GetArchName(), Object_GetAttackMovement(), Object_GetAttackType(), Object_GetBeenApplied(), Object_GetBelow(), Object_GetBlind(), Object_GetBlocksView(), Object_GetCanCastSpell(), Object_GetCanSeeInDark(), Object_GetCanSeeInvisible(), Object_GetCanUseArmour(), Object_GetCanUseBow(), Object_GetCanUseRing(), Object_GetCanUseScroll(), Object_GetCanUseSkill(), Object_GetCanUseWand(), Object_GetCanUseWeapon(), Object_GetCha(), Object_GetCon(), Object_GetConfused(), Object_GetContainer(), Object_GetCount(), Object_GetCursed(), Object_GetDam(), Object_GetDamned(), Object_GetDex(), Object_GetDirection(), Object_GetDM(), Object_GetDuration(), Object_GetEnemy(), Object_GetEnv(), Object_GetExp(), Object_GetExpMul(), Object_GetFace(), Object_GetFacing(), Object_GetFloor(), Object_GetFood(), Object_GetFriendly(), Object_GetGenerator(), Object_GetGlowRadius(), Object_GetGod(), Object_GetGodGiven(), Object_GetGrace(), Object_GetHasXRays(), Object_GetHitBack(), Object_GetHP(), Object_GetIdentified(), Object_GetInt(), Object_GetInventory(), Object_GetInvisible(), Object_GetIsPet(), Object_GetKnownCursed(), Object_GetKnownMagical(), Object_GetLastEat(), Object_GetLastGrace(), Object_GetLastSP(), Object_GetLevel(), Object_GetLifesaver(), Object_GetLuck(), Object_GetMakeInvisible(), Object_GetMap(), Object_GetMaterial(), Object_GetMaxGrace(), Object_GetMaxHP(), Object_GetMaxSP(), Object_GetMessage(), Object_GetMoney(), Object_GetMonster(), Object_GetMoveAllow(), Object_GetMoveBlock(), Object_GetMoveOff(), Object_GetMoveOn(), Object_GetMoveSlow(), Object_GetMoveSlowPenalty(), Object_GetMoveType(), Object_GetName(), Object_GetNamePl(), Object_GetNoDamage(), Object_GetNoSave(), Object_GetOnlyAttack(), Object_GetOtherArchetype(), Object_GetOwner(), Object_GetPermExp(), Object_GetPickable(), Object_GetPow(), Object_GetQuantity(), Object_GetRace(), Object_GetRandomMovement(), Object_GetReflectMissiles(), Object_GetReflectSpells(), Object_GetRollable(), Object_GetRunAway(), Object_GetScared(), Object_GetSkill(), Object_GetSlaying(), Object_GetSleeping(), Object_GetSP(), Object_GetSpeed(), Object_GetSpeedLeft(), Object_GetSplitting(), Object_GetStandStill(), Object_GetStealthy(), Object_GetStr(), Object_GetSubtype(), Object_GetThrown(), Object_GetTitle(), Object_GetTurnable(), Object_GetType(), Object_GetUnaggressive(), Object_GetUndead(), Object_GetUnique(), Object_GetUnpaid(), Object_GetUsedUp(), Object_GetValue(), Object_GetWasDM(), Object_GetWeight(), Object_GetWeightLimit(), Object_GetWis(), Object_GetX(), Object_GetY(), Player_GetBedMap(), Player_GetBedX(), Player_GetBedY(), Player_GetIP(), Player_GetMarkedItem(), Player_GetParty(), Player_GetTitle(), Player_GiveKnowledge(), Player_KnowledgeKnown(), Player_QuestGetState(), Player_QuestSetState(), Player_QuestStart(), and Player_QuestWasCompleted(). Definition at line 50 of file cfpython_object.c. Referenced by Crossfire_Object_InternalCompare(), Object_SetAC(), Object_SetAlive(), Object_SetAnim(), Object_SetAnimated(), Object_SetAnimSpeed(), Object_SetApplied(), Object_SetAttackMovement(), Object_SetAttackType(), Object_SetBlind(), Object_SetBlocksView(), Object_SetCanSeeInDark(), Object_SetCanSeeInvisible(), Object_SetCha(), Object_SetCon(), Object_SetConfused(), Object_SetCursed(), Object_SetDam(), Object_SetDamned(), Object_SetDex(), Object_SetDirection(), Object_SetDuration(), Object_SetEnemy(), Object_SetExp(), Object_SetFace(), Object_SetFacing(), Object_SetFood(), Object_SetFriendly(), Object_SetGlowRadius(), Object_SetGod(), Object_SetGodGiven(), Object_SetGrace(), Object_SetHasXRays(), Object_SetHitBack(), Object_SetHP(), Object_SetIdentified(), Object_SetInt(), Object_SetInvisible(), Object_SetIsPet(), Object_SetKnownCursed(), Object_SetKnownMagical(), Object_SetLastEat(), Object_SetLastGrace(), Object_SetLastSP(), Object_SetLifesaver(), Object_SetMakeInvisible(), Object_SetMap(), Object_SetMaxGrace(), Object_SetMaxHP(), Object_SetMaxSP(), Object_SetMessage(), Object_SetMoveAllow(), Object_SetMoveBlock(), Object_SetMoveOff(), Object_SetMoveOn(), Object_SetMoveSlow(), Object_SetMoveType(), Object_SetName(), Object_SetNamePl(), Object_SetNoDamage(), Object_SetNoSave(), Object_SetOnlyAttack(), Object_SetOwner(), Object_SetPickable(), Object_SetPow(), Object_SetQuantity(), Object_SetRace(), Object_SetRandomMovement(), Object_SetReflectMissiles(), Object_SetReflectSpells(), Object_SetRollable(), Object_SetRunAway(), Object_SetScared(), Object_SetSkill(), Object_SetSlaying(), Object_SetSleeping(), Object_SetSP(), Object_SetSpeed(), Object_SetSpeedLeft(), Object_SetStandStill(), Object_SetStealthy(), Object_SetStr(), Object_SetTitle(), Object_SetTurnable(), Object_SetUnaggressive(), Object_SetUndead(), Object_SetUnique(), Object_SetUnpaid(), Object_SetUsedUp(), Object_SetValue(), Object_SetWC(), Object_SetWeight(), Object_SetWeightLimit(), Object_SetWis(), Player_SetBedMap(), Player_SetBedX(), Player_SetBedY(), Player_SetMarkedItem(), Player_SetParty(), and Player_SetTitle(). This is meant to be used for parameters where you don't know if the type of the object is correct. It should NOT be used for the self pointer, since that will always be a compatible type. Definition at line 44 of file cfpython_object.c. Referenced by Crossfire_Object_ActivateRune(), Crossfire_Object_ChangeAbil(), Crossfire_Object_CheckTrigger(), Crossfire_Object_Drop(), Crossfire_Object_ForgetSpell(), Crossfire_Object_InsertInto(), Crossfire_Object_LearnSpell(), Crossfire_Object_Pay(), and Crossfire_Object_Take(). Definition at line 64 of file cfpython_object.c. Definition at line 2176 of file cfpython_object.c. References cf_spring_trap(), EXISTCHECK, Crossfire_Object::obj, and TYPEEXISTCHECK. Definition at line 2503 of file cfpython_object.c. References cf_object_change_exp(), EXISTCHECK, and Crossfire_Object::obj. Definition at line 2075 of file cfpython_object.c. References cf_object_apply(), Crossfire_ObjectType, EXISTCHECK, flags, and Crossfire_Object::obj. Definition at line 2564 of file cfpython_object.c. References cf_player_arrest(), EXISTCHECK, and Crossfire_Object::obj. Definition at line 2282 of file cfpython_object.c. References cf_object_cast_spell(), Crossfire_ObjectType, EXISTCHECK, and Crossfire_Object::obj. Definition at line 2336 of file cfpython_object.c. References cf_object_cast_ability(), Crossfire_ObjectType, EXISTCHECK, and Crossfire_Object::obj. Definition at line 2493 of file cfpython_object.c. References cf_object_change_abil(), EXISTCHECK, Crossfire_Object::obj, and TYPEEXISTCHECK. Definition at line 2437 of file cfpython_object.c. References cf_object_find_by_arch_name(), Crossfire_Object_wrap(), EXISTCHECK, and Crossfire_Object::obj. Definition at line 2414 of file cfpython_object.c. References cf_object_present_archname_inside(), Crossfire_Object_wrap(), EXISTCHECK, and Crossfire_Object::obj. Definition at line 2191 of file cfpython_object.c. References cf_object_check_trigger(), EXISTCHECK, Crossfire_Object::obj, and TYPEEXISTCHECK. Definition at line 2099 of file cfpython_object.c. References cf_object_clone(), Crossfire_Object_wrap(), and Crossfire_Object::obj. Definition at line 2459 of file cfpython_object.c. References cf_create_object_by_name(), cf_object_insert_object(), Crossfire_Object_wrap(), EXISTCHECK, and Crossfire_Object::obj. Definition at line 2403 of file cfpython_object.c. References cf_timer_create(), EXISTCHECK, and Crossfire_Object::obj. Definition at line 2877 of file cfpython_object.c. Definition at line 2087 of file cfpython_object.c. References cf_object_drop(), EXISTCHECK, Crossfire_Object::obj, and TYPEEXISTCHECK. Definition at line 2534 of file cfpython_object.c. References cf_object_user_event(), Crossfire_ObjectType, EXISTCHECK, and Crossfire_Object::obj. Definition at line 2144 of file cfpython_object.c. Definition at line 2311 of file cfpython_object.c. References cf_object_forget_spell(), EXISTCHECK, Crossfire_Object::obj, and TYPEEXISTCHECK. Definition at line 2449 of file cfpython_object.c. References cf_object_out_of_map(), EXISTCHECK, and Crossfire_Object::obj. Definition at line 2258 of file cfpython_object.c. References cf_object_get_resistance(), EXISTCHECK, NROFATTACKS, and Crossfire_Object::obj. Definition at line 2474 of file cfpython_object.c. References cf_object_get_flag(), cf_object_insert_in_ob(), cf_object_remove(), Crossfire_Object_wrap(), EXISTCHECK, FLAG_REMOVED, Crossfire_Object::obj, and TYPEEXISTCHECK. Definition at line 2618 of file cfpython_object.c. Definition at line 2569 of file cfpython_object.c. Definition at line 2323 of file cfpython_object.c. References cf_object_check_for_spell(), Crossfire_Object_wrap(), EXISTCHECK, and Crossfire_Object::obj. Definition at line 2298 of file cfpython_object.c. References cf_object_learn_spell(), EXISTCHECK, Crossfire_Object::obj, and TYPEEXISTCHECK. Definition at line 2613 of file cfpython_object.c. Definition at line 2516 of file cfpython_object.c. References cf_object_move(), EXISTCHECK, and Crossfire_Object::obj. Definition at line 2525 of file cfpython_object.c. References cf_object_move_to(), EXISTCHECK, and Crossfire_Object::obj. Definition at line 2865 of file cfpython_object.c. Definition at line 2365 of file cfpython_object.c. References cf_object_pay_item(), EXISTCHECK, Crossfire_Object::obj, and TYPEEXISTCHECK. Definition at line 2352 of file cfpython_object.c. References cf_object_pay_amount(), EXISTCHECK, and Crossfire_Object::obj. Definition at line 2251 of file cfpython_object.c. References cf_query_name(), EXISTCHECK, and Crossfire_Object::obj. Definition at line 2378 of file cfpython_object.c. References cf_object_get_key(), EXISTCHECK, and Crossfire_Object::obj. Definition at line 2060 of file cfpython_object.c. References cf_object_free_drop_inventory(), cf_object_get_flag(), cf_object_remove(), current_context, EXISTCHECK, FLAG_REMOVED, Crossfire_Object::obj, and _cfpcontext::who. Definition at line 2554 of file cfpython_object.c. References cf_object_remove_depletion(), EXISTCHECK, and Crossfire_Object::obj. Definition at line 2239 of file cfpython_object.c. References cf_object_transfer(), EXISTCHECK, and Crossfire_Object::obj. Definition at line 2575 of file cfpython_object.c. Definition at line 2207 of file cfpython_object.c. References cf_add_string(), cf_log(), cf_object_say(), current_context, EXISTCHECK, llevError, MAX_NPC, obj::name, talk_info::npc_msg_count, talk_info::npc_msgs, Crossfire_Object::obj, snprintf, and _cfpcontext::talk. Definition at line 2270 of file cfpython_object.c. References cf_object_set_resistance(), EXISTCHECK, NROFATTACKS, and Crossfire_Object::obj. Definition at line 2123 of file cfpython_object.c. References cf_object_split(), Crossfire_Object_wrap(), and Crossfire_Object::obj. Definition at line 2150 of file cfpython_object.c. References cf_object_pickup(), EXISTCHECK, Crossfire_Object::obj, and TYPEEXISTCHECK. Definition at line 2162 of file cfpython_object.c. References cf_object_teleport(), Crossfire_MapType, EXISTCHECK, Crossfire_Map::map, and Crossfire_Object::obj. Definition at line 3057 of file cfpython_object.c. References add_object_assoc(), Crossfire_Object::count, Crossfire_Player::count, obj::count, Crossfire_ObjectType, Crossfire_PlayerType, find_assoc_pyobject(), Crossfire_Object::obj, Crossfire_Player::obj, object_was_destroyed, PLAYER, and obj::type. Referenced by cfpython_globalEventListener(), cfpython_runPluginCommand(), createCFObject(), createCFObjectByName(), Crossfire_Archetype_GetClone(), Crossfire_Archetype_GetNewObject(), Crossfire_Object_CheckArchInventory(), Crossfire_Object_CheckInventory(), Crossfire_Object_Clone(), Crossfire_Object_CreateInside(), Crossfire_Object_InsertInto(), Crossfire_Object_KnowSpell(), Crossfire_Object_Split(), Crossfire_Party_GetPlayers(), eventListener(), findPlayer(), getFriendlyList(), getPlayers(), Map_Check(), Map_CreateObject(), Map_GetFirstObjectAt(), Map_Insert(), Map_InsertAround(), Object_GetAbove(), Object_GetBelow(), Object_GetContainer(), Object_GetEnemy(), Object_GetEnv(), Object_GetInventory(), Object_GetOwner(), and Player_GetMarkedItem(). Definition at line 2391 of file cfpython_object.c. References cf_object_set_key(), EXISTCHECK, and Crossfire_Object::obj. Definition at line 175 of file cfpython_object.c. References cf_player_can_pay(), EXISTCHECK, and Crossfire_Player::obj. Definition at line 2901 of file cfpython_object.c. Definition at line 124 of file cfpython_object.c. References cf_player_message(), EXISTCHECK, NDI_ORANGE, NDI_UNIQUE, and Crossfire_Player::obj. Definition at line 2889 of file cfpython_object.c. Definition at line 68 of file cfpython_object.c. Definition at line 72 of file cfpython_object.c. Referenced by Crossfire_Object_dealloc(), and Crossfire_Player_dealloc(). Definition at line 60 of file cfpython_object.c. Definition at line 463 of file cfpython_object.c. References cf_object_get_object_property(), CFAPI_OBJECT_PROP_OB_ABOVE, Crossfire_Object_wrap(), EXISTCHECK, and Crossfire_Object::obj. Definition at line 394 of file cfpython_object.c. References cf_object_get_int_property(), CFAPI_OBJECT_PROP_AC, EXISTCHECK, and Crossfire_Object::obj. Definition at line 594 of file cfpython_object.c. References cf_object_get_flag(), EXISTCHECK, FLAG_ALIVE, and Crossfire_Object::obj. Definition at line 568 of file cfpython_object.c. References cf_object_get_string_property(), CFAPI_OBJECT_PROP_ANIMATION, EXISTCHECK, and Crossfire_Object::obj. Definition at line 949 of file cfpython_object.c. References cf_object_get_flag(), EXISTCHECK, FLAG_ANIMATE, and Crossfire_Object::obj. Definition at line 574 of file cfpython_object.c. References cf_object_get_int_property(), CFAPI_OBJECT_PROP_ANIM_SPEED, EXISTCHECK, and Crossfire_Object::obj. Definition at line 609 of file cfpython_object.c. References cf_object_get_flag(), EXISTCHECK, FLAG_APPLIED, and Crossfire_Object::obj. Definition at line 834 of file cfpython_object.c. References cf_object_get_archetype_property(), CFAPI_OBJECT_PROP_ARCHETYPE, Crossfire_Archetype_wrap(), EXISTCHECK, and Crossfire_Object::obj. Definition at line 829 of file cfpython_object.c. References cf_object_get_sstring_property(), CFAPI_OBJECT_PROP_ARCH_NAME, EXISTCHECK, and Crossfire_Object::obj. Definition at line 934 of file cfpython_object.c. References cf_object_get_int_property(), CFAPI_OBJECT_PROP_ATTACK_MOVEMENT, EXISTCHECK, and Crossfire_Object::obj. Definition at line 579 of file cfpython_object.c. References cf_object_get_int_property(), CFAPI_OBJECT_PROP_ATTACK_TYPE, EXISTCHECK, and Crossfire_Object::obj. Definition at line 584 of file cfpython_object.c. References cf_object_get_flag(), EXISTCHECK, FLAG_BEEN_APPLIED, and Crossfire_Object::obj. Definition at line 471 of file cfpython_object.c. References cf_object_get_object_property(), CFAPI_OBJECT_PROP_OB_BELOW, Crossfire_Object_wrap(), EXISTCHECK, and Crossfire_Object::obj. Definition at line 664 of file cfpython_object.c. References cf_object_get_flag(), EXISTCHECK, FLAG_BLIND, and Crossfire_Object::obj. Definition at line 784 of file cfpython_object.c. References cf_object_get_flag(), EXISTCHECK, FLAG_BLOCKSVIEW, and Crossfire_Object::obj. Definition at line 749 of file cfpython_object.c. References cf_object_get_flag(), EXISTCHECK, FLAG_CAST_SPELL, and Crossfire_Object::obj. Definition at line 724 of file cfpython_object.c. References cf_object_get_flag(), EXISTCHECK, FLAG_SEE_IN_DARK, and Crossfire_Object::obj. Definition at line 639 of file cfpython_object.c. References cf_object_get_flag(), EXISTCHECK, FLAG_SEE_INVISIBLE, and Crossfire_Object::obj. Definition at line 739 of file cfpython_object.c. References cf_object_get_flag(), EXISTCHECK, FLAG_USE_ARMOUR, and Crossfire_Object::obj. Definition at line 714 of file cfpython_object.c. References cf_object_get_flag(), EXISTCHECK, FLAG_USE_BOW, and Crossfire_Object::obj. Definition at line 709 of file cfpython_object.c. References cf_object_get_flag(), EXISTCHECK, FLAG_USE_RING, and Crossfire_Object::obj. Definition at line 744 of file cfpython_object.c. References cf_object_get_flag(), EXISTCHECK, FLAG_USE_SCROLL, and Crossfire_Object::obj. Definition at line 669 of file cfpython_object.c. References cf_object_get_flag(), EXISTCHECK, FLAG_CAN_USE_SKILL, and Crossfire_Object::obj. Definition at line 719 of file cfpython_object.c. References cf_object_get_flag(), EXISTCHECK, FLAG_USE_RANGE, and Crossfire_Object::obj. Definition at line 734 of file cfpython_object.c. References cf_object_get_flag(), EXISTCHECK, FLAG_USE_WEAPON, and Crossfire_Object::obj. Definition at line 324 of file cfpython_object.c. References cf_object_get_int_property(), CFAPI_OBJECT_PROP_CHA, EXISTCHECK, and Crossfire_Object::obj. Definition at line 329 of file cfpython_object.c. References cf_object_get_int_property(), CFAPI_OBJECT_PROP_CON, EXISTCHECK, and Crossfire_Object::obj. Definition at line 684 of file cfpython_object.c. References cf_object_get_flag(), EXISTCHECK, FLAG_CONFUSED, and Crossfire_Object::obj. Definition at line 957 of file cfpython_object.c. References cf_object_get_object_property(), CFAPI_OBJECT_PROP_CONTAINER, Crossfire_Object_wrap(), EXISTCHECK, and Crossfire_Object::obj. Definition at line 909 of file cfpython_object.c. References cf_object_get_int_property(), CFAPI_OBJECT_PROP_COUNT, EXISTCHECK, and Crossfire_Object::obj. Definition at line 443 of file cfpython_object.c. References cf_object_get_flag(), EXISTCHECK, FLAG_CURSED, and Crossfire_Object::obj. Definition at line 403 of file cfpython_object.c. References cf_object_get_int_property(), CFAPI_OBJECT_PROP_DAM, EXISTCHECK, and Crossfire_Object::obj. Definition at line 448 of file cfpython_object.c. References cf_object_get_flag(), EXISTCHECK, FLAG_DAMNED, and Crossfire_Object::obj. Definition at line 334 of file cfpython_object.c. References cf_object_get_int_property(), CFAPI_OBJECT_PROP_DEX, EXISTCHECK, and Crossfire_Object::obj. Definition at line 497 of file cfpython_object.c. References cf_object_get_int_property(), CFAPI_OBJECT_PROP_DIRECTION, EXISTCHECK, and Crossfire_Object::obj. Definition at line 599 of file cfpython_object.c. References cf_object_get_flag(), EXISTCHECK, FLAG_WIZ, and Crossfire_Object::obj. Definition at line 939 of file cfpython_object.c. References cf_object_get_int_property(), CFAPI_OBJECT_PROP_DURATION, EXISTCHECK, and Crossfire_Object::obj. Definition at line 904 of file cfpython_object.c. References cf_object_get_object_property(), CFAPI_OBJECT_PROP_ENEMY, Crossfire_Object_wrap(), EXISTCHECK, and Crossfire_Object::obj. Definition at line 859 of file cfpython_object.c. References cf_object_get_object_property(), CFAPI_OBJECT_PROP_ENVIRONMENT, Crossfire_Object_wrap(), EXISTCHECK, and Crossfire_Object::obj. Definition at line 849 of file cfpython_object.c. References obj::count, Crossfire_Object::obj, and object_was_destroyed. Definition at line 423 of file cfpython_object.c. References cf_object_get_int64_property(), CFAPI_OBJECT_PROP_EXP, EXISTCHECK, and Crossfire_Object::obj. Definition at line 433 of file cfpython_object.c. References cf_object_get_double_property(), CFAPI_OBJECT_PROP_EXP_MULTIPLIER, EXISTCHECK, and Crossfire_Object::obj. Definition at line 562 of file cfpython_object.c. References cf_object_get_string_property(), CFAPI_OBJECT_PROP_FACE, EXISTCHECK, and Crossfire_Object::obj. Definition at line 502 of file cfpython_object.c. References cf_object_get_int_property(), CFAPI_OBJECT_PROP_FACING, EXISTCHECK, and Crossfire_Object::obj. Definition at line 699 of file cfpython_object.c. References cf_object_get_flag(), EXISTCHECK, FLAG_IS_FLOOR, and Crossfire_Object::obj. Definition at line 389 of file cfpython_object.c. References cf_object_get_int_property(), CFAPI_OBJECT_PROP_FP, EXISTCHECK, and Crossfire_Object::obj. Definition at line 624 of file cfpython_object.c. References cf_object_get_flag(), EXISTCHECK, FLAG_FRIENDLY, and Crossfire_Object::obj. Definition at line 629 of file cfpython_object.c. References cf_object_get_flag(), EXISTCHECK, FLAG_GENERATOR, and Crossfire_Object::obj. Definition at line 944 of file cfpython_object.c. References cf_object_get_int_property(), CFAPI_OBJECT_PROP_GLOW_RADIUS, EXISTCHECK, and Crossfire_Object::obj. Definition at line 512 of file cfpython_object.c. References cf_object_get_sstring_property(), CFAPI_OBJECT_PROP_GOD, EXISTCHECK, and Crossfire_Object::obj. Definition at line 914 of file cfpython_object.c. 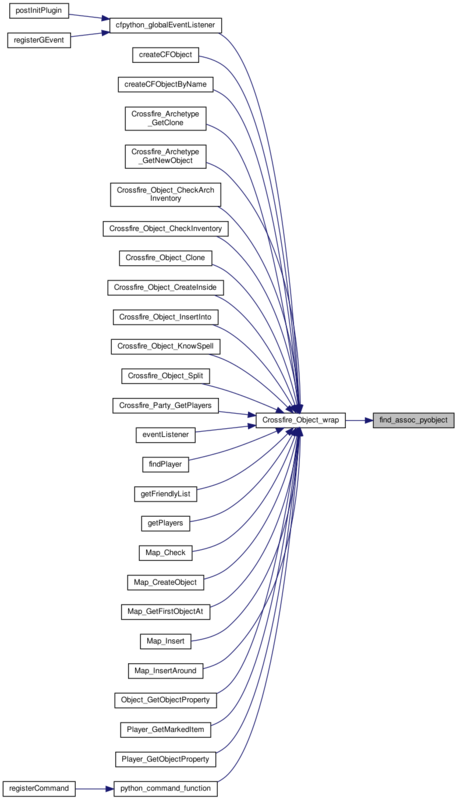 References cf_object_get_flag(), EXISTCHECK, FLAG_STARTEQUIP, and Crossfire_Object::obj. Definition at line 379 of file cfpython_object.c. References cf_object_get_int_property(), CFAPI_OBJECT_PROP_GP, EXISTCHECK, and Crossfire_Object::obj. Definition at line 704 of file cfpython_object.c. References cf_object_get_flag(), EXISTCHECK, FLAG_XRAYS, and Crossfire_Object::obj. Definition at line 789 of file cfpython_object.c. References cf_object_get_flag(), EXISTCHECK, FLAG_HITBACK, and Crossfire_Object::obj. Definition at line 359 of file cfpython_object.c. References cf_object_get_int_property(), CFAPI_OBJECT_PROP_HP, EXISTCHECK, and Crossfire_Object::obj. Definition at line 589 of file cfpython_object.c. References cf_object_get_flag(), EXISTCHECK, FLAG_IDENTIFIED, and Crossfire_Object::obj. Definition at line 339 of file cfpython_object.c. References cf_object_get_int_property(), CFAPI_OBJECT_PROP_INT, EXISTCHECK, and Crossfire_Object::obj. Definition at line 479 of file cfpython_object.c. References cf_object_get_object_property(), CFAPI_OBJECT_PROP_INVENTORY, Crossfire_Object_wrap(), EXISTCHECK, and Crossfire_Object::obj. Definition at line 527 of file cfpython_object.c. References cf_object_get_int_property(), CFAPI_OBJECT_PROP_INVISIBLE, EXISTCHECK, and Crossfire_Object::obj. Definition at line 929 of file cfpython_object.c. References cf_object_get_int_property(), CFAPI_OBJECT_PROP_FRIENDLY, EXISTCHECK, and Crossfire_Object::obj. Definition at line 674 of file cfpython_object.c. References cf_object_get_flag(), EXISTCHECK, FLAG_KNOWN_CURSED, and Crossfire_Object::obj. Definition at line 729 of file cfpython_object.c. References cf_object_get_flag(), EXISTCHECK, FLAG_KNOWN_MAGICAL, and Crossfire_Object::obj. Definition at line 552 of file cfpython_object.c. References cf_object_get_int_property(), CFAPI_OBJECT_PROP_LAST_EAT, EXISTCHECK, and Crossfire_Object::obj. Definition at line 547 of file cfpython_object.c. References cf_object_get_int_property(), CFAPI_OBJECT_PROP_LAST_GRACE, EXISTCHECK, and Crossfire_Object::obj. Definition at line 542 of file cfpython_object.c. References cf_object_get_int_property(), CFAPI_OBJECT_PROP_LAST_SP, EXISTCHECK, and Crossfire_Object::obj. Definition at line 557 of file cfpython_object.c. References cf_object_get_int_property(), CFAPI_OBJECT_PROP_LEVEL, EXISTCHECK, and Crossfire_Object::obj. Definition at line 694 of file cfpython_object.c. References cf_object_get_flag(), EXISTCHECK, FLAG_LIFESAVE, and Crossfire_Object::obj. Definition at line 408 of file cfpython_object.c. References cf_object_get_int_property(), CFAPI_OBJECT_PROP_LUCK, EXISTCHECK, and Crossfire_Object::obj. Definition at line 804 of file cfpython_object.c. References cf_object_get_flag(), EXISTCHECK, FLAG_MAKE_INVIS, and Crossfire_Object::obj. Definition at line 316 of file cfpython_object.c. References cf_object_get_map_property(), CFAPI_OBJECT_PROP_MAP, Crossfire_Map_wrap(), EXISTCHECK, and Crossfire_Object::obj. Definition at line 953 of file cfpython_object.c. References cf_object_get_int_property(), cf_object_get_sstring_property(), CFAPI_OBJECT_PROP_MATERIAL, CFAPI_OBJECT_PROP_MATERIAL_NAME, EXISTCHECK, and Crossfire_Object::obj. Definition at line 384 of file cfpython_object.c. References cf_object_get_int_property(), CFAPI_OBJECT_PROP_MAXGP, EXISTCHECK, and Crossfire_Object::obj. Definition at line 364 of file cfpython_object.c. References cf_object_get_int_property(), CFAPI_OBJECT_PROP_MAXHP, EXISTCHECK, and Crossfire_Object::obj. Definition at line 374 of file cfpython_object.c. References cf_object_get_int_property(), CFAPI_OBJECT_PROP_MAXSP, EXISTCHECK, and Crossfire_Object::obj. Definition at line 413 of file cfpython_object.c. References cf_object_get_sstring_property(), CFAPI_OBJECT_PROP_MESSAGE, EXISTCHECK, and Crossfire_Object::obj. Definition at line 809 of file cfpython_object.c. References cf_object_query_money(), EXISTCHECK, and Crossfire_Object::obj. Definition at line 619 of file cfpython_object.c. 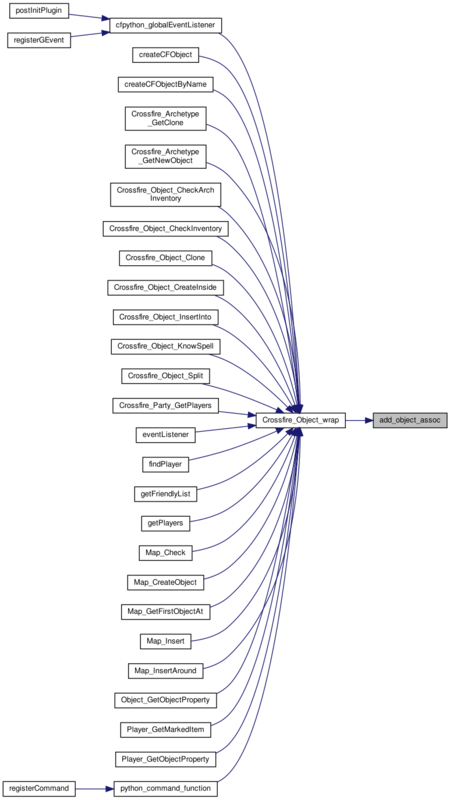 References cf_object_get_flag(), EXISTCHECK, FLAG_MONSTER, and Crossfire_Object::obj. Definition at line 874 of file cfpython_object.c. References cf_object_get_movetype_property(), CFAPI_OBJECT_PROP_MOVE_ALLOW, EXISTCHECK, and Crossfire_Object::obj. Definition at line 869 of file cfpython_object.c. References cf_object_get_movetype_property(), CFAPI_OBJECT_PROP_MOVE_BLOCK, EXISTCHECK, and Crossfire_Object::obj. Definition at line 884 of file cfpython_object.c. References cf_object_get_movetype_property(), CFAPI_OBJECT_PROP_MOVE_OFF, EXISTCHECK, and Crossfire_Object::obj. Definition at line 879 of file cfpython_object.c. References cf_object_get_movetype_property(), CFAPI_OBJECT_PROP_MOVE_ON, EXISTCHECK, and Crossfire_Object::obj. Definition at line 889 of file cfpython_object.c. References cf_object_get_movetype_property(), CFAPI_OBJECT_PROP_MOVE_SLOW, EXISTCHECK, and Crossfire_Object::obj. Definition at line 894 of file cfpython_object.c. References cf_object_get_float_property(), CFAPI_OBJECT_PROP_MOVE_SLOW_PENALTY, EXISTCHECK, and Crossfire_Object::obj. Definition at line 864 of file cfpython_object.c. References cf_object_get_movetype_property(), CFAPI_OBJECT_PROP_MOVE_TYPE, EXISTCHECK, and Crossfire_Object::obj. Definition at line 294 of file cfpython_object.c. Definition at line 301 of file cfpython_object.c. References cf_query_name_pl(), EXISTCHECK, and Crossfire_Object::obj. Definition at line 919 of file cfpython_object.c. References cf_object_get_flag(), EXISTCHECK, FLAG_NO_DAMAGE, and Crossfire_Object::obj. Definition at line 844 of file cfpython_object.c. References cf_object_get_flag(), EXISTCHECK, FLAG_NO_SAVE, and Crossfire_Object::obj. Definition at line 799 of file cfpython_object.c. References cf_object_get_flag(), EXISTCHECK, FLAG_ONLY_ATTACK, and Crossfire_Object::obj. Definition at line 839 of file cfpython_object.c. References cf_object_get_archetype_property(), CFAPI_OBJECT_PROP_OTHER_ARCH, Crossfire_Archetype_wrap(), EXISTCHECK, and Crossfire_Object::obj. Definition at line 899 of file cfpython_object.c. References cf_object_get_object_property(), CFAPI_OBJECT_PROP_OWNER, Crossfire_Object_wrap(), EXISTCHECK, and Crossfire_Object::obj. Definition at line 428 of file cfpython_object.c. References cf_object_get_int64_property(), CFAPI_OBJECT_PROP_PERM_EXP, EXISTCHECK, and Crossfire_Object::obj. Definition at line 517 of file cfpython_object.c. References cf_object_get_flag(), EXISTCHECK, FLAG_NO_PICK, and Crossfire_Object::obj. Definition at line 344 of file cfpython_object.c. References cf_object_get_int_property(), CFAPI_OBJECT_PROP_POW, EXISTCHECK, and Crossfire_Object::obj. Definition at line 522 of file cfpython_object.c. References cf_object_get_int_property(), CFAPI_OBJECT_PROP_NROF, EXISTCHECK, and Crossfire_Object::obj. Definition at line 311 of file cfpython_object.c. References cf_object_get_sstring_property(), CFAPI_OBJECT_PROP_RACE, EXISTCHECK, and Crossfire_Object::obj. Definition at line 924 of file cfpython_object.c. References cf_object_get_flag(), EXISTCHECK, FLAG_RANDOM_MOVE, and Crossfire_Object::obj. Definition at line 759 of file cfpython_object.c. References cf_object_get_flag(), EXISTCHECK, FLAG_REFL_MISSILE, and Crossfire_Object::obj. Definition at line 754 of file cfpython_object.c. References cf_object_get_flag(), EXISTCHECK, FLAG_REFL_SPELL, and Crossfire_Object::obj. Definition at line 644 of file cfpython_object.c. References cf_object_get_flag(), EXISTCHECK, FLAG_CAN_ROLL, and Crossfire_Object::obj. Definition at line 769 of file cfpython_object.c. References cf_object_get_flag(), EXISTCHECK, FLAG_RUN_AWAY, and Crossfire_Object::obj. Definition at line 774 of file cfpython_object.c. References cf_object_get_flag(), EXISTCHECK, FLAG_SCARED, and Crossfire_Object::obj. Definition at line 418 of file cfpython_object.c. References cf_object_get_sstring_property(), CFAPI_OBJECT_PROP_SKILL, EXISTCHECK, and Crossfire_Object::obj. Definition at line 438 of file cfpython_object.c. References cf_object_get_sstring_property(), CFAPI_OBJECT_PROP_SLAYING, EXISTCHECK, and Crossfire_Object::obj. Definition at line 689 of file cfpython_object.c. References cf_object_get_flag(), EXISTCHECK, FLAG_SLEEP, and Crossfire_Object::obj. Definition at line 369 of file cfpython_object.c. References cf_object_get_int_property(), CFAPI_OBJECT_PROP_SP, EXISTCHECK, and Crossfire_Object::obj. Definition at line 532 of file cfpython_object.c. References cf_object_get_float_property(), CFAPI_OBJECT_PROP_SPEED, EXISTCHECK, and Crossfire_Object::obj. Definition at line 537 of file cfpython_object.c. References cf_object_get_float_property(), CFAPI_OBJECT_PROP_SPEED_LEFT, EXISTCHECK, and Crossfire_Object::obj. Definition at line 659 of file cfpython_object.c. References cf_object_get_flag(), EXISTCHECK, FLAG_SPLITTING, and Crossfire_Object::obj. Definition at line 794 of file cfpython_object.c. References cf_object_get_flag(), EXISTCHECK, FLAG_STAND_STILL, and Crossfire_Object::obj. Definition at line 679 of file cfpython_object.c. References cf_object_get_flag(), EXISTCHECK, FLAG_STEALTH, and Crossfire_Object::obj. Definition at line 349 of file cfpython_object.c. References cf_object_get_int_property(), CFAPI_OBJECT_PROP_STR, EXISTCHECK, and Crossfire_Object::obj. Definition at line 819 of file cfpython_object.c. References cf_object_get_int_property(), CFAPI_OBJECT_PROP_SUBTYPE, EXISTCHECK, and Crossfire_Object::obj. Definition at line 634 of file cfpython_object.c. References cf_object_get_flag(), EXISTCHECK, FLAG_IS_THROWN, and Crossfire_Object::obj. Definition at line 306 of file cfpython_object.c. References cf_object_get_sstring_property(), CFAPI_OBJECT_PROP_TITLE, EXISTCHECK, and Crossfire_Object::obj. Definition at line 649 of file cfpython_object.c. References cf_object_get_flag(), EXISTCHECK, FLAG_IS_TURNABLE, and Crossfire_Object::obj. Definition at line 814 of file cfpython_object.c. References cf_object_get_int_property(), CFAPI_OBJECT_PROP_TYPE, EXISTCHECK, and Crossfire_Object::obj. Definition at line 507 of file cfpython_object.c. References cf_object_get_flag(), EXISTCHECK, FLAG_UNAGGRESSIVE, and Crossfire_Object::obj. Definition at line 779 of file cfpython_object.c. References cf_object_get_flag(), EXISTCHECK, FLAG_UNDEAD, and Crossfire_Object::obj. Definition at line 764 of file cfpython_object.c. References cf_object_get_flag(), EXISTCHECK, FLAG_UNIQUE, and Crossfire_Object::obj. Definition at line 614 of file cfpython_object.c. References cf_object_get_flag(), EXISTCHECK, FLAG_UNPAID, and Crossfire_Object::obj. Definition at line 654 of file cfpython_object.c. References cf_object_get_flag(), EXISTCHECK, FLAG_IS_USED_UP, and Crossfire_Object::obj. Definition at line 824 of file cfpython_object.c. References cf_object_get_long_property(), CFAPI_OBJECT_PROP_VALUE, EXISTCHECK, and Crossfire_Object::obj. Definition at line 604 of file cfpython_object.c. References cf_object_get_flag(), EXISTCHECK, FLAG_WAS_WIZ, and Crossfire_Object::obj. Definition at line 399 of file cfpython_object.c. References cf_object_get_int_property(), CFAPI_OBJECT_PROP_WC, and Crossfire_Object::obj. Definition at line 453 of file cfpython_object.c. References cf_object_get_int_property(), CFAPI_OBJECT_PROP_WEIGHT, EXISTCHECK, and Crossfire_Object::obj. Definition at line 458 of file cfpython_object.c. References cf_object_get_int_property(), CFAPI_OBJECT_PROP_WEIGHT_LIMIT, EXISTCHECK, and Crossfire_Object::obj. Definition at line 354 of file cfpython_object.c. References cf_object_get_int_property(), CFAPI_OBJECT_PROP_WIS, EXISTCHECK, and Crossfire_Object::obj. Definition at line 487 of file cfpython_object.c. References cf_object_get_int_property(), CFAPI_OBJECT_PROP_X, EXISTCHECK, and Crossfire_Object::obj. Definition at line 492 of file cfpython_object.c. References cf_object_get_int_property(), CFAPI_OBJECT_PROP_Y, EXISTCHECK, and Crossfire_Object::obj. Definition at line 1290 of file cfpython_object.c. References cf_object_set_int_property(), CFAPI_OBJECT_PROP_AC, EXISTCHECK_INT, and Crossfire_Object::obj. Definition at line 1527 of file cfpython_object.c. References cf_object_set_flag(), EXISTCHECK_INT, FLAG_ALIVE, and Crossfire_Object::obj. Definition at line 1478 of file cfpython_object.c. References cf_object_set_animation(), EXISTCHECK_INT, and Crossfire_Object::obj. Definition at line 1987 of file cfpython_object.c. References cf_object_set_flag(), EXISTCHECK_INT, FLAG_ANIMATE, and Crossfire_Object::obj. Definition at line 1493 of file cfpython_object.c. References cf_object_set_int_property(), CFAPI_OBJECT_PROP_ANIM_SPEED, EXISTCHECK_INT, and Crossfire_Object::obj. Definition at line 1129 of file cfpython_object.c. References cf_object_set_flag(), EXISTCHECK_INT, FLAG_APPLIED, and Crossfire_Object::obj. Definition at line 1943 of file cfpython_object.c. References cf_object_set_int_property(), CFAPI_OBJECT_PROP_ATTACK_MOVEMENT, EXISTCHECK_INT, and Crossfire_Object::obj. Definition at line 1504 of file cfpython_object.c. References cf_object_set_int_property(), CFAPI_OBJECT_PROP_ATTACK_TYPE, EXISTCHECK_INT, and Crossfire_Object::obj. Definition at line 1637 of file cfpython_object.c. References cf_object_set_flag(), EXISTCHECK_INT, FLAG_BLIND, and Crossfire_Object::obj. Definition at line 1802 of file cfpython_object.c. References cf_object_set_flag(), EXISTCHECK_INT, FLAG_BLOCKSVIEW, and Crossfire_Object::obj. Definition at line 1714 of file cfpython_object.c. References cf_object_set_flag(), EXISTCHECK_INT, FLAG_SEE_IN_DARK, and Crossfire_Object::obj. Definition at line 1593 of file cfpython_object.c. References cf_object_set_flag(), EXISTCHECK_INT, FLAG_SEE_INVISIBLE, and Crossfire_Object::obj. Definition at line 1212 of file cfpython_object.c. References cf_object_set_int_property(), CFAPI_OBJECT_PROP_CHA, EXISTCHECK_INT, and Crossfire_Object::obj. Definition at line 1164 of file cfpython_object.c. References cf_object_set_int_property(), CFAPI_OBJECT_PROP_CON, EXISTCHECK_INT, and Crossfire_Object::obj. Definition at line 1670 of file cfpython_object.c. References cf_object_set_flag(), EXISTCHECK_INT, FLAG_CONFUSED, and Crossfire_Object::obj. Definition at line 1107 of file cfpython_object.c. References cf_object_set_flag(), EXISTCHECK_INT, FLAG_CURSED, and Crossfire_Object::obj. Definition at line 1312 of file cfpython_object.c. References cf_object_set_int_property(), CFAPI_OBJECT_PROP_DAM, EXISTCHECK_INT, and Crossfire_Object::obj. Definition at line 1118 of file cfpython_object.c. References cf_object_set_flag(), EXISTCHECK_INT, FLAG_DAMNED, and Crossfire_Object::obj. Definition at line 1152 of file cfpython_object.c. References cf_object_set_int_property(), CFAPI_OBJECT_PROP_DEX, EXISTCHECK_INT, and Crossfire_Object::obj. Definition at line 1356 of file cfpython_object.c. References cf_object_set_int_property(), CFAPI_OBJECT_PROP_DIRECTION, EXISTCHECK_INT, and Crossfire_Object::obj. Definition at line 1965 of file cfpython_object.c. References cf_object_set_int_property(), CFAPI_OBJECT_PROP_DURATION, EXISTCHECK_INT, and Crossfire_Object::obj. Definition at line 1889 of file cfpython_object.c. References cf_object_set_object_property(), CFAPI_OBJECT_PROP_ENEMY, Crossfire_ObjectType, EXISTCHECK_INT, and Crossfire_Object::obj. Definition at line 1954 of file cfpython_object.c. References cf_object_set_int64_property(), CFAPI_OBJECT_PROP_EXP, EXISTCHECK_INT, and Crossfire_Object::obj. Definition at line 1464 of file cfpython_object.c. References cf_object_set_face(), EXISTCHECK_INT, and Crossfire_Object::obj. Definition at line 1367 of file cfpython_object.c. References cf_object_set_int_property(), CFAPI_OBJECT_PROP_FACING, EXISTCHECK_INT, and Crossfire_Object::obj. Definition at line 1323 of file cfpython_object.c. References cf_object_set_int_property(), CFAPI_OBJECT_PROP_FP, EXISTCHECK_INT, and Crossfire_Object::obj. Definition at line 1582 of file cfpython_object.c. References cf_object_set_flag(), EXISTCHECK_INT, FLAG_FRIENDLY, and Crossfire_Object::obj. Definition at line 1976 of file cfpython_object.c. References cf_object_set_int_property(), CFAPI_OBJECT_PROP_GLOW_RADIUS, EXISTCHECK_INT, and Crossfire_Object::obj. Definition at line 1378 of file cfpython_object.c. References cf_object_set_string_property(), CFAPI_OBJECT_PROP_GOD, EXISTCHECK_INT, and Crossfire_Object::obj. Definition at line 1899 of file cfpython_object.c. References cf_object_set_flag(), EXISTCHECK_INT, FLAG_STARTEQUIP, and Crossfire_Object::obj. Definition at line 1268 of file cfpython_object.c. References cf_object_set_int_property(), CFAPI_OBJECT_PROP_GP, EXISTCHECK_INT, and Crossfire_Object::obj. Definition at line 1703 of file cfpython_object.c. References cf_object_set_flag(), EXISTCHECK_INT, FLAG_XRAYS, and Crossfire_Object::obj. Definition at line 1813 of file cfpython_object.c. References cf_object_set_flag(), EXISTCHECK_INT, FLAG_HITBACK, and Crossfire_Object::obj. Definition at line 1224 of file cfpython_object.c. References cf_object_set_int_property(), CFAPI_OBJECT_PROP_HP, EXISTCHECK_INT, and Crossfire_Object::obj. Definition at line 1516 of file cfpython_object.c. References cf_object_set_flag(), EXISTCHECK_INT, FLAG_IDENTIFIED, and Crossfire_Object::obj. Definition at line 1176 of file cfpython_object.c. References cf_object_set_int_property(), CFAPI_OBJECT_PROP_INT, EXISTCHECK_INT, and Crossfire_Object::obj. Definition at line 1560 of file cfpython_object.c. References cf_object_set_int_property(), CFAPI_OBJECT_PROP_INVISIBLE, EXISTCHECK_INT, and Crossfire_Object::obj. Definition at line 1932 of file cfpython_object.c. References cf_object_set_int_property(), CFAPI_OBJECT_PROP_FRIENDLY, EXISTCHECK_INT, and Crossfire_Object::obj. Definition at line 1648 of file cfpython_object.c. References cf_object_set_flag(), EXISTCHECK_INT, FLAG_KNOWN_CURSED, and Crossfire_Object::obj. Definition at line 1725 of file cfpython_object.c. References cf_object_set_flag(), EXISTCHECK_INT, FLAG_KNOWN_MAGICAL, and Crossfire_Object::obj. Definition at line 1453 of file cfpython_object.c. References cf_object_set_int_property(), CFAPI_OBJECT_PROP_LAST_EAT, EXISTCHECK_INT, and Crossfire_Object::obj. Definition at line 1441 of file cfpython_object.c. References cf_object_set_int_property(), CFAPI_OBJECT_PROP_LAST_GRACE, EXISTCHECK_INT, and Crossfire_Object::obj. Definition at line 1429 of file cfpython_object.c. References cf_object_set_int_property(), CFAPI_OBJECT_PROP_LAST_SP, EXISTCHECK_INT, and Crossfire_Object::obj. Definition at line 1692 of file cfpython_object.c. References cf_object_set_flag(), EXISTCHECK_INT, FLAG_LIFESAVE, and Crossfire_Object::obj. Definition at line 1846 of file cfpython_object.c. References cf_object_set_flag(), EXISTCHECK_INT, FLAG_MAKE_INVIS, and Crossfire_Object::obj. Definition at line 1058 of file cfpython_object.c. References cf_object_change_map(), Crossfire_MapType, EXISTCHECK_INT, Crossfire_Map::map, and Crossfire_Object::obj. Definition at line 1279 of file cfpython_object.c. References cf_object_set_int_property(), CFAPI_OBJECT_PROP_MAXGP, EXISTCHECK_INT, and Crossfire_Object::obj. Definition at line 1235 of file cfpython_object.c. References cf_object_set_int_property(), CFAPI_OBJECT_PROP_MAXHP, EXISTCHECK_INT, and Crossfire_Object::obj. Definition at line 1257 of file cfpython_object.c. References cf_object_set_int_property(), CFAPI_OBJECT_PROP_MAXSP, EXISTCHECK_INT, and Crossfire_Object::obj. Definition at line 962 of file cfpython_object.c. References CF_IS_PYSTR, cf_object_set_string_property(), CFAPI_OBJECT_PROP_MESSAGE, EXISTCHECK_INT, and Crossfire_Object::obj. Definition at line 2017 of file cfpython_object.c. References cf_object_set_movetype_property(), CFAPI_OBJECT_PROP_MOVE_ALLOW, EXISTCHECK_INT, and Crossfire_Object::obj. Definition at line 2007 of file cfpython_object.c. References cf_object_set_movetype_property(), CFAPI_OBJECT_PROP_MOVE_BLOCK, EXISTCHECK_INT, and Crossfire_Object::obj. Definition at line 2037 of file cfpython_object.c. References cf_object_set_movetype_property(), CFAPI_OBJECT_PROP_MOVE_OFF, EXISTCHECK_INT, and Crossfire_Object::obj. Definition at line 2027 of file cfpython_object.c. References cf_object_set_movetype_property(), CFAPI_OBJECT_PROP_MOVE_ON, EXISTCHECK_INT, and Crossfire_Object::obj. Definition at line 2047 of file cfpython_object.c. References cf_object_set_movetype_property(), CFAPI_OBJECT_PROP_MOVE_SLOW, EXISTCHECK_INT, and Crossfire_Object::obj. Definition at line 1997 of file cfpython_object.c. References cf_object_set_movetype_property(), CFAPI_OBJECT_PROP_MOVE_TYPE, EXISTCHECK_INT, MOVE_ALL, and Crossfire_Object::obj. Definition at line 981 of file cfpython_object.c. References CF_IS_PYSTR, cf_object_set_string_property(), CFAPI_OBJECT_PROP_NAME, CFAPI_OBJECT_PROP_NAME_PLURAL, EXISTCHECK_INT, and Crossfire_Object::obj. Definition at line 1001 of file cfpython_object.c. References CF_IS_PYSTR, cf_object_set_string_property(), CFAPI_OBJECT_PROP_NAME_PLURAL, EXISTCHECK_INT, and Crossfire_Object::obj. Definition at line 1910 of file cfpython_object.c. References cf_object_set_flag(), EXISTCHECK_INT, FLAG_NO_DAMAGE, and Crossfire_Object::obj. Definition at line 1868 of file cfpython_object.c. References cf_object_set_flag(), EXISTCHECK_INT, FLAG_NO_SAVE, and Crossfire_Object::obj. Definition at line 1835 of file cfpython_object.c. References cf_object_set_flag(), EXISTCHECK_INT, FLAG_ONLY_ATTACK, and Crossfire_Object::obj. Definition at line 1879 of file cfpython_object.c. References cf_object_set_object_property(), CFAPI_OBJECT_PROP_OWNER, Crossfire_ObjectType, EXISTCHECK_INT, and Crossfire_Object::obj. Definition at line 1549 of file cfpython_object.c. References cf_object_set_flag(), EXISTCHECK_INT, FLAG_NO_PICK, and Crossfire_Object::obj. Definition at line 1188 of file cfpython_object.c. References cf_object_set_int_property(), CFAPI_OBJECT_PROP_POW, EXISTCHECK_INT, and Crossfire_Object::obj. Definition at line 1413 of file cfpython_object.c. References cf_object_set_nrof(), EXISTCHECK_INT, and Crossfire_Object::obj. Definition at line 1039 of file cfpython_object.c. References CF_IS_PYSTR, cf_object_set_string_property(), CFAPI_OBJECT_PROP_RACE, EXISTCHECK_INT, and Crossfire_Object::obj. Definition at line 1921 of file cfpython_object.c. References cf_object_set_flag(), EXISTCHECK_INT, FLAG_RANDOM_MOVE, and Crossfire_Object::obj. Definition at line 1747 of file cfpython_object.c. References cf_object_set_flag(), EXISTCHECK_INT, FLAG_REFL_MISSILE, and Crossfire_Object::obj. Definition at line 1736 of file cfpython_object.c. References cf_object_set_flag(), EXISTCHECK_INT, FLAG_REFL_SPELL, and Crossfire_Object::obj. Definition at line 1604 of file cfpython_object.c. References cf_object_set_flag(), EXISTCHECK_INT, FLAG_CAN_ROLL, and Crossfire_Object::obj. Definition at line 1769 of file cfpython_object.c. References cf_object_set_flag(), EXISTCHECK_INT, FLAG_RUN_AWAY, and Crossfire_Object::obj. Definition at line 1780 of file cfpython_object.c. References cf_object_set_flag(), EXISTCHECK_INT, FLAG_SCARED, and Crossfire_Object::obj. Definition at line 1088 of file cfpython_object.c. References CF_IS_PYSTR, cf_object_set_string_property(), CFAPI_OBJECT_PROP_SKILL, EXISTCHECK_INT, and Crossfire_Object::obj. Definition at line 1069 of file cfpython_object.c. References CF_IS_PYSTR, cf_object_set_string_property(), CFAPI_OBJECT_PROP_SLAYING, EXISTCHECK_INT, and Crossfire_Object::obj. Definition at line 1681 of file cfpython_object.c. References cf_object_set_flag(), EXISTCHECK_INT, FLAG_SLEEP, and Crossfire_Object::obj. Definition at line 1246 of file cfpython_object.c. References cf_object_set_int_property(), CFAPI_OBJECT_PROP_SP, EXISTCHECK_INT, and Crossfire_Object::obj. Definition at line 1389 of file cfpython_object.c. References cf_object_set_float_property(), CFAPI_OBJECT_PROP_SPEED, EXISTCHECK_INT, and Crossfire_Object::obj. Definition at line 1401 of file cfpython_object.c. References cf_object_set_float_property(), CFAPI_OBJECT_PROP_SPEED_LEFT, EXISTCHECK_INT, and Crossfire_Object::obj. Definition at line 1824 of file cfpython_object.c. References cf_object_set_flag(), EXISTCHECK_INT, FLAG_STAND_STILL, and Crossfire_Object::obj. Definition at line 1659 of file cfpython_object.c. References cf_object_set_flag(), EXISTCHECK_INT, FLAG_STEALTH, and Crossfire_Object::obj. Definition at line 1140 of file cfpython_object.c. References cf_object_set_int_property(), CFAPI_OBJECT_PROP_STR, EXISTCHECK_INT, and Crossfire_Object::obj. Definition at line 1020 of file cfpython_object.c. References CF_IS_PYSTR, cf_object_set_string_property(), CFAPI_OBJECT_PROP_TITLE, EXISTCHECK_INT, and Crossfire_Object::obj. Definition at line 1615 of file cfpython_object.c. References cf_object_set_flag(), EXISTCHECK_INT, FLAG_IS_TURNABLE, and Crossfire_Object::obj. Definition at line 1538 of file cfpython_object.c. References cf_object_set_flag(), EXISTCHECK_INT, FLAG_UNAGGRESSIVE, and Crossfire_Object::obj. Definition at line 1791 of file cfpython_object.c. References cf_object_set_flag(), EXISTCHECK_INT, FLAG_UNDEAD, and Crossfire_Object::obj. Definition at line 1758 of file cfpython_object.c. References cf_object_set_flag(), EXISTCHECK_INT, FLAG_UNIQUE, and Crossfire_Object::obj. Definition at line 1571 of file cfpython_object.c. References cf_object_set_flag(), EXISTCHECK_INT, FLAG_UNPAID, and Crossfire_Object::obj. Definition at line 1626 of file cfpython_object.c. References cf_object_set_flag(), EXISTCHECK_INT, FLAG_IS_USED_UP, and Crossfire_Object::obj. Definition at line 1857 of file cfpython_object.c. References cf_object_set_long_property(), CFAPI_OBJECT_PROP_VALUE, EXISTCHECK_INT, and Crossfire_Object::obj. Definition at line 1301 of file cfpython_object.c. References cf_object_set_int_property(), CFAPI_OBJECT_PROP_WC, EXISTCHECK_INT, and Crossfire_Object::obj. Definition at line 1334 of file cfpython_object.c. References cf_object_set_int_property(), CFAPI_OBJECT_PROP_WEIGHT, EXISTCHECK_INT, and Crossfire_Object::obj. Definition at line 1345 of file cfpython_object.c. References cf_object_set_int_property(), CFAPI_OBJECT_PROP_WEIGHT_LIMIT, EXISTCHECK_INT, and Crossfire_Object::obj. Definition at line 1200 of file cfpython_object.c. References cf_object_set_int_property(), CFAPI_OBJECT_PROP_WIS, EXISTCHECK_INT, and Crossfire_Object::obj. Definition at line 180 of file cfpython_object.c. References cf_object_get_string_property(), CFAPI_PLAYER_PROP_BED_MAP, EXISTCHECK, and Crossfire_Player::obj. Definition at line 197 of file cfpython_object.c. References cf_object_get_int_property(), CFAPI_PLAYER_PROP_BED_X, EXISTCHECK, and Crossfire_Player::obj. Definition at line 212 of file cfpython_object.c. References cf_object_get_int_property(), CFAPI_PLAYER_PROP_BED_Y, EXISTCHECK, and Crossfire_Player::obj. Definition at line 101 of file cfpython_object.c. References cf_player_get_ip(), EXISTCHECK, and Crossfire_Player::obj. Definition at line 106 of file cfpython_object.c. References cf_player_get_marked_item(), Crossfire_Object_wrap(), EXISTCHECK, and Crossfire_Player::obj. Definition at line 160 of file cfpython_object.c. References cf_player_get_party(), Crossfire_Party_wrap(), EXISTCHECK, and Crossfire_Player::obj. Definition at line 76 of file cfpython_object.c. References cf_player_get_title(), EXISTCHECK, MAX_NAME, and Crossfire_Object::obj. Definition at line 147 of file cfpython_object.c. References cf_player_knowledge_give(), EXISTCHECK, and Crossfire_Player::obj. Definition at line 137 of file cfpython_object.c. References cf_player_knowledge_has(), EXISTCHECK, and Crossfire_Player::obj. Definition at line 244 of file cfpython_object.c. References cf_add_string(), cf_free_string(), cf_quest_get_player_state(), EXISTCHECK, and Crossfire_Player::obj. Definition at line 260 of file cfpython_object.c. References cf_add_string(), cf_free_string(), cf_quest_set_player_state(), EXISTCHECK, and Crossfire_Player::obj. Definition at line 227 of file cfpython_object.c. References cf_add_string(), cf_free_string(), cf_quest_start(), EXISTCHECK, and Crossfire_Player::obj. Definition at line 277 of file cfpython_object.c. References cf_add_string(), cf_free_string(), cf_quest_was_completed(), EXISTCHECK, and Crossfire_Player::obj. Definition at line 187 of file cfpython_object.c. References cf_object_set_string_property(), CFAPI_PLAYER_PROP_BED_MAP, EXISTCHECK_INT, and Crossfire_Player::obj. Definition at line 202 of file cfpython_object.c. References cf_object_set_int_property(), CFAPI_PLAYER_PROP_BED_X, EXISTCHECK_INT, and Crossfire_Player::obj. Definition at line 217 of file cfpython_object.c. References cf_object_set_int_property(), CFAPI_PLAYER_PROP_BED_Y, EXISTCHECK_INT, and Crossfire_Player::obj. Definition at line 111 of file cfpython_object.c. References cf_player_set_marked_item(), Crossfire_ObjectType, EXISTCHECK_INT, Crossfire_Object::obj, and Crossfire_Player::obj. Definition at line 165 of file cfpython_object.c. References cf_player_set_party(), Crossfire_PartyType, EXISTCHECK_INT, Crossfire_Player::obj, and Crossfire_Party::party. Definition at line 82 of file cfpython_object.c. References CF_IS_PYSTR, cf_player_set_title(), EXISTCHECK_INT, and Crossfire_Object::obj. Definition at line 2914 of file cfpython_object.c. Referenced by cfpython_init_types(), Crossfire_Object_Apply(), Crossfire_Object_Cast(), Crossfire_Object_CastAbility(), Crossfire_Object_Event(), Crossfire_Object_RichCompare(), Crossfire_Object_wrap(), Map_Insert(), Map_InsertAround(), Map_TriggerConnected(), npcSay(), Object_SetEnemy(), Object_SetOwner(), and Player_SetMarkedItem(). Definition at line 2998 of file cfpython_object.c. Referenced by cfpython_init_types(), and Crossfire_Object_wrap(). Definition at line 57 of file cfpython_object.c. Referenced by add_object_assoc(), find_assoc_pyobject(), free_object_assoc(), and init_object_assoc_table(). Definition at line 2624 of file cfpython_object.c. Definition at line 2800 of file cfpython_object.c. Definition at line 2758 of file cfpython_object.c. Definition at line 2973 of file cfpython_object.c. Definition at line 2984 of file cfpython_object.c.